Summer skiing soon a thing of the past? At a time when winter is the furthest from most people's minds, diehard skiers head up-mountain to continue skiing and snowboarding during the summer months. But there are fewer and fewer sites where this is possible. The combined effects of global warming and less abundant snowfalls has lead to glacial melting throughout the Alps. Over the last 20 years, several Swiss resorts--Verbier, Les Diablerets, Flims Laax, Crans-Montana, St Moritz--have had to close their summer skiing areas. The Zermatt and Saas Fee resorts, where the glaciers are situated at very high altitudes--the Theodule glacier in Zermatt stands at 3,900 m--and which enjoy excellent north-facing locations, are practically the only Swiss resorts left today where summer skiing is still possible. The situation is no different on the French side of the Alps: the summer-ski area in Les Grands Montets had to be closed at the end of the 80s. Because of glacial retreat, summer skiing had become too dangerous. Summer skiing in Val Thorens and Alpe d'Huez suffered the same fate. 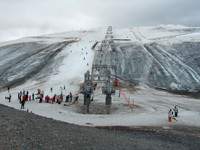 Today, only three resorts in France are still able to offer glacial conditions suitable for summer skiing. The 3 resorts--Les 2 Alpes, Tignes and Val d'Isère (which re-opened its summer-ski area)--share a clientele which, paradoxically, is growing in size. Without a doubt, the Les 2 Alpes glacier offers the best conditions for summer skiing in France. Situated at an altitude of between 3,200 and 3,600 m, it is predominantly north-facing, and therefore enjoys some degree of protection from the summer sun. The ice cap and slopes are a quick ride away on the Jandri Express gondola lift, which departs from the resort at an altitude of 1,600 m. But the future of summer skiing in Les 2 Alpes is uncertain: the ice front is receding and the thickness of the ice is diminishing. 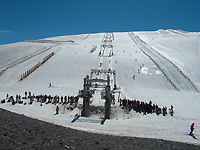 Some mechanical lifts, originally installed on the glacier, are now in contact with surface rock and can no longer be used. 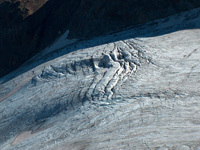 Crevasses form with increasing frequency, and patches of bare ice appear on the slopes as the summer advances. Another problem, which is certainly more complex to deal with, is that, as the glacier diminishes in thickness, rocky outcrops begin to emerge at the surface. What measures can be taken to preserve the future of summer skiing? The challenge is great, especially for high-level skiers, who need to be able to continue training throughout the summer in preparation for the winter season. Although the southern hemisphere boasts several beautiful skiing area during the souther winter, getting there can be costly. Fortunately, the glacier development team, managed by 2 Alpes Loisirs, is teeming with ideas and spares no effort to provide a high-quality service. Ski patrollers are constantly on the look-out for the formation of new fissures, which can appear at any time. 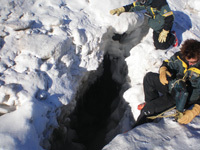 Newly formed crevasses are immediately filled in with snow using snow ploughs. A colossal job! 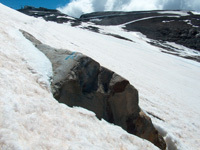 Wooden "wind-breaking" barriers, used to facilitate the accumulation of snow, have been set up on several spots on the glacier. 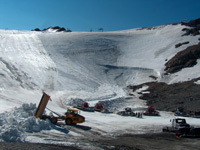 These stockpiles of snow are then transported to critical areas in the skiing area. The skier's worst enemy, however, is the previously ice-covered rocky relief. As the glacial ice melts, rocky outcrops can appear in unpredictable places, even in the middle of a slope. And, unfortunately, there is no real solution to this problem. To preserve the future of summer skiing, major development work will need to be undertaken in the coming years. If the stockpiles of snow accumulated in certain parts of the glacier prove to be insufficient, one solution could be the installation of artificial snow machines. This is quite feasible from a technical point of view, since some summer evenings are cold enough for the use of snow cannon. Even at the height of summer, temperatures frequently fall below zero at altitudes above 3000 m. Of course, impleneting such measures raise not only ethical and ecological issues, but also financial issues, since theses types of installations are very costly. But Les 2 Alpes glacier is vast, and there are other expanses, with better snowfall, which could be developed. Pending a better solution, as soon as the skiers are back down in the valley, men and their machines begin the unending task of scraping the ice, rebuilding mounds of snow and filling in crevasses with one question at the front of their minds: how long will the glacier be able to resist? 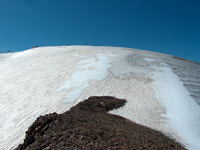 An undeveloped part of the glacier with good snow-cover conditions, even at the end of the summer. If you can't wait until next winter to put on your skis, you'll need to hurry: Les 2 Alpes glacier will be open until August 29. And although the best conditions can be found at the beginning of the summer, brief episodes of snowfall are not uncommon in the middle of August. The mechanical lifts are open from 7 a.m. to 12:30 p.m. Bear in mind, though, that you will need to get up early since the quality of the snow changes very quickly and deteriorates as the day progresses. Free skiing is possible but since the ski area is not very large, especially at the end of summer, some of the lifts will be closed on account of a lack of snow. What better opportunity to try your hand at slalom skiing, or to take one of the courses in competition skiing offered throughout the year. For those who are not too fond of skiing between gates, there is a large snow park with jumping, half-pipe and boarder-cross facilities enabling you to work on your freestyle technique. The glacier closes on August 29th but opens again for the November (All Saints) holidays. This year Les 2 Alps won't be hosting the World Ski and Snowboard championships. Guide to Les 2 Alpes: snowfall, slope maps, forum, etc.